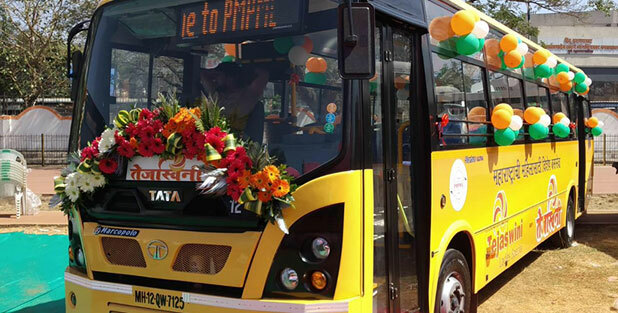 Continuing with its commitment to revolutionize public transportation, Tata Motors, India’s largest commercial vehicle player today announced the delivery of six women friendly Tata Ultra 9m Diesel Midi buses to the Pune Mahanagar Parivahan Mahamandal Limited (PMPML). Built on the new ULTRA platform, these buses meet requirements of every stakeholder – Driver, Passenger and Operator. The Automated Manual Transmission (AMT) technology provides superior experience for the drivers enabling them to operate without fatigue. To ensure the safety and security of women commuters, the bus is equipped with best-in-class features such as Fire Detection & Suppression System (FDSS). The CCTV cameras providing an Intelligence Transport Systems (ITS) for public information in addition to the electronic destination display boards supported via GPS. With an inbuilt telematics system, the vehicle empowers State Transport Units (STUs) with a more connected experience, thereby, increasing operational efficiency and providing user friendly vehicle maintenance and tracking.